If you’ve got the money you now have three new soft tops to spend it on: The new Audi Cabrio, the new Mercedes CLK Cabrio and now the new SAAB 9-3 convertible. 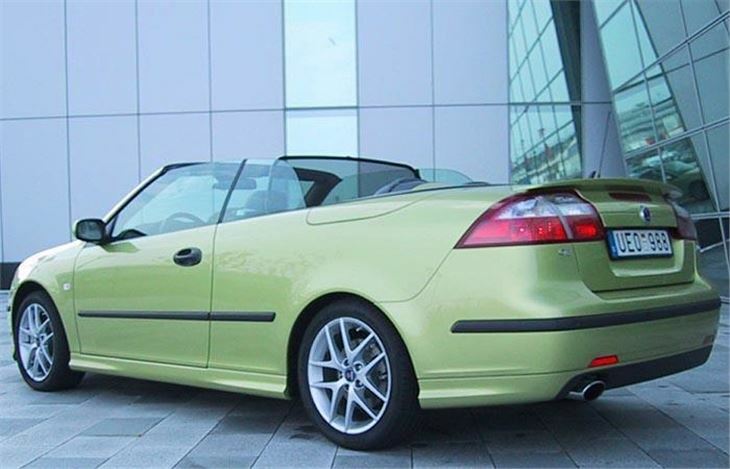 Add the BMW 3-Series and the Volvo C70 to your soft topping list and there’s plenty of choice out there. 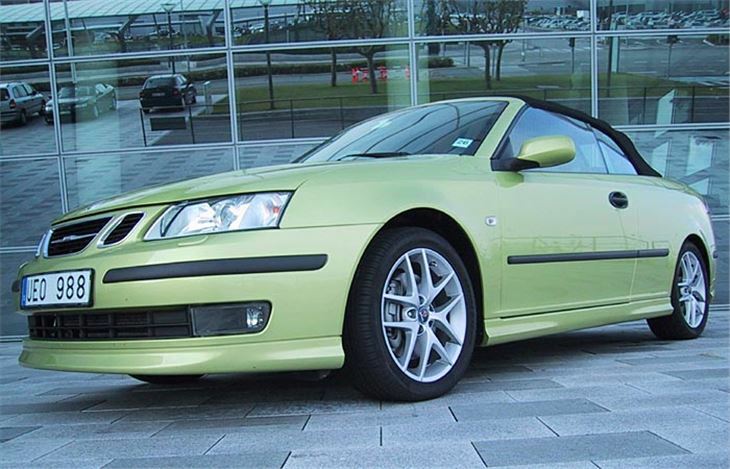 Like the CLK, the improvements in the new SAAB are so huge they instantly push the old model past its sell-by date. Access cards and the old SAAB 9-3s were both your flexible friends. Potholes and traffic harming measures rattled their composure to such an extent you could feel the structure twisting and squirming. This didn’t do much for the Cavalier handling of the car either, turning a severe understeerer into a game of scrabble when seriously pressing on. 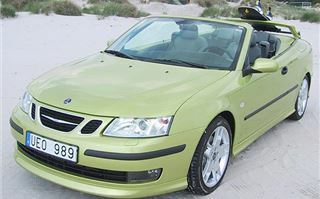 SAAB was so confident it had done the job, our test was to drive over the cobbled city centre of Copenhagen, then go for a cross country open road blast. Our top of the range 210bhp Sentronic automatic Aero was so composed over the cobblestones and so sweet in city traffic, we were only conscious it was a convertible by the sky over our heads. It was pleasant, relaxing; the perfect city and suburban convertible, giving no hint of that 210bhp under its bonnet. As usual, the seats are superb. They and the steering wheel are almost infinitely adjustable so you achieve almost instant comfort. And SAAB has gone one step smarter than Mercedes here. The seat belts are built into the seats, so are easy to get hold of. They don’t have to be handed to you by electric arms as in the CLK. Out in the country, the Sentronic steering wheel buttonshift 5-speed autobox impressed me as much as the car’s composure and handling. It’s very easy indeed to downshift to overtake without taking your hands from the wheel. And if you then find you’ve dialled in just a little bit too much speed for the next corner you can judiciously left foot brake to achieve better turn-in without turnin’ a drama into a crisis. Should you do something totally daft and completely roll the car, two strong steel roll bars pop up behind the back seats to protect everybody’s heads. 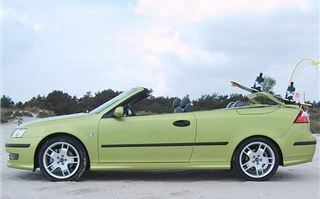 If it suddenly starts to rain, the thick good-looking top goes up in around 20 seconds, pretty much the same as the CLK cabrio. 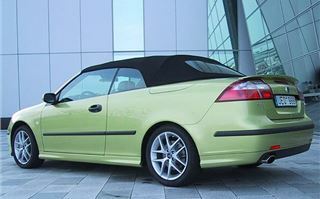 That automatically raises the SAAB’s stowage compartment floor, increasing boot capacity from 235 litres to 356 litres. But obviously you can’t put the top down when the boot is full of your holiday luggage. You can carry bits on the back, though. 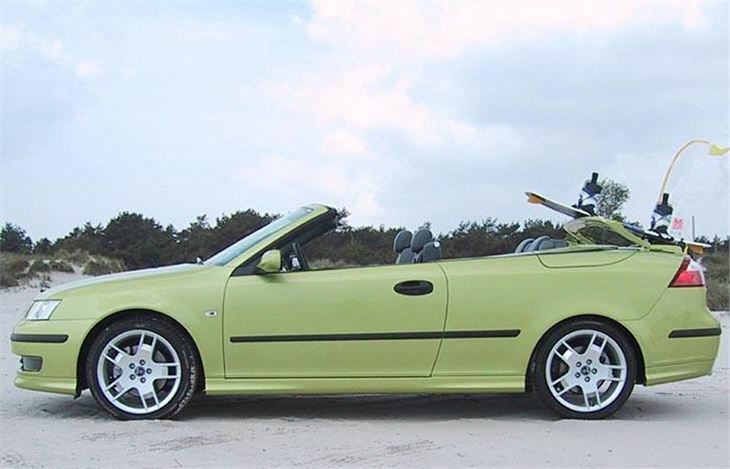 An accessory boot spoiler doubles up as a ski/boogie board holder as you can see in one of the photos. Though top-up visibility is improved with a larger glass rear window and this is very much an all weather car, the interior is snug rather than bright and airy like the Mercedes. We also tried the less powerful 175bhp 2.0t Vector model, again an automatic but without the Sentronic steering wheel shifters. It’s still a good car, plenty powerful enough for most of us and with a slightly softer ride than the Aero which most convertible buyers will probably prefer. 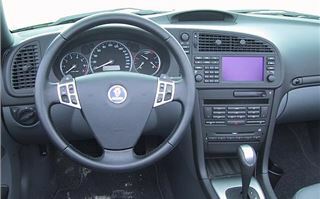 The lack of steering wheel buttons wasn’t too much of a come-down either because though the Tiptronic shift is the wrong way round, it still works very well and, if you forget to shift down when you should have done, it does the job for you. SAAB talked about value for money. 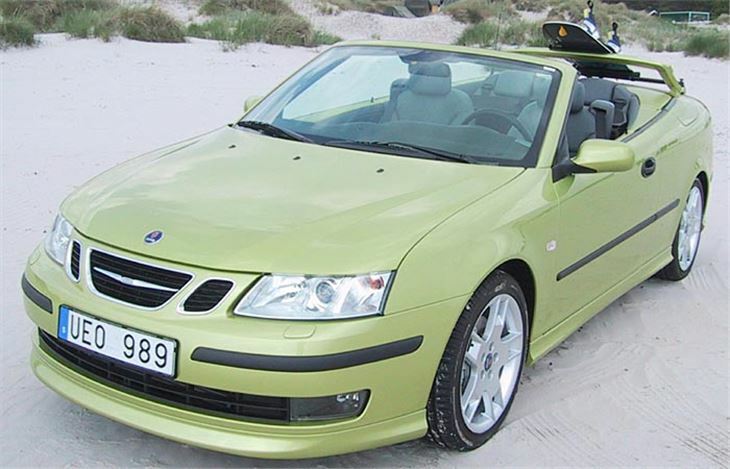 You actually get more car in the SAAB than you do from Audi or BMW or Mercedes. In some cases, speccing a BMW 3 Series to the same level as a SAAB could cost you more than £7,000 more. 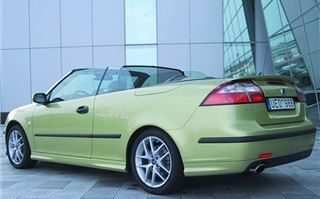 And that, as well as the charisma of the car, is why SAAB expects to lead the premium convertible market in a few years time. SAAB has done before, so this is no idle claim, and we do buy a lot of convertibles. Only now we don’t have to be a bit soft topped to buy one.